Is violence on the streets caused by violence in video games? Does cyber-bullying lead to an increase in suicide rates? Are teens promiscuous because of Teen Mom? 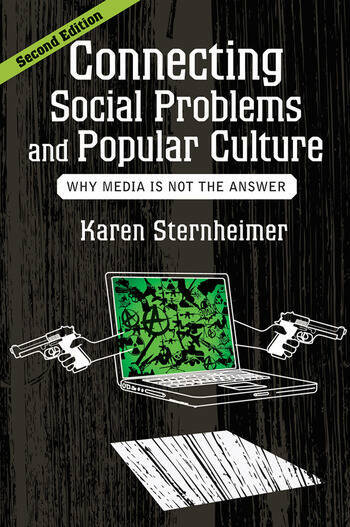 As Karen Sternheimer clearly demonstrates, popular culture is an easy scapegoat for many of society's problems, but it is almost always the wrong answer. Now in its second edition, Connecting Social Problems and Popular Culture goes beyond the news-grabbing headlines claiming that popular culture is public enemy number one to consider what really causes the social problems we are most concerned about. The sobering fact is that a "media made them do it" explanation fails to illuminate the roots of social problems like poverty, violence, and environmental degradation. Sternheimer's analysis deftly illustrates how welfare "reform," a two-tiered health care system, and other difficult systemic issues have far more to do with our contemporary social problems than Grand Theft Auto or Facebook. The fully-revised new edition features recent moral panics (think sexting and cyberbullying) and an entirely new chapter exploring social media. Expanded discussion of how we understand society's problems as social constructions without disregarding empirical evidence, as well as the cultural and structural issues underlying those ills, allows students to stretch their sociological imaginations.